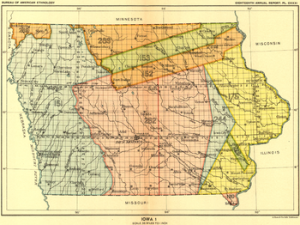 On September 21, 1832, the Black Hawk Purchase (yellow portion) was completed. Six million acres occupied by the Sauk, Meskwaki (Fox) and Ho-Chunk (Winnebago) sold for a price equivalent to 11 cents per acre. The Treaty that followed was ratified on Feb 13, 1833. On June 1, 1833 the territory opened for settlement by non-Native Americans. In the Fall of 1833, Abraham C. Dover came from Illinois and built a cabin on the present site of New London. In 1837, Dover and Benjamin Mathews laid out the village beside Abraham’s cabin which is now the City Park and the subsequent village was called Dover. In 1840, Dover sold the land to an Englishman named Jonathan J. King then renamed the village New London. This entry was posted in History on June 9, 2014 by vlekstrand.